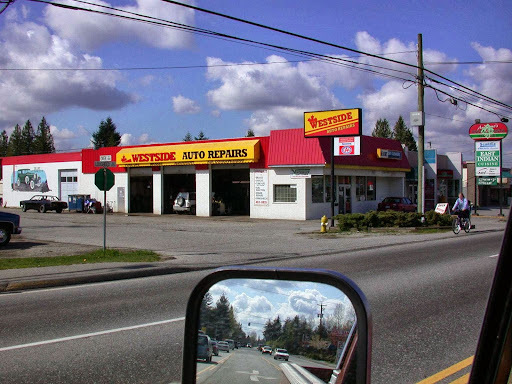 What excellent customer service I experienced at Westside Auto Repairs today! I originally drove in just to have my tire patched (it had been slowly leaking and I had to fill it up every 4 days) but when they took the tire off, they found that the side wall was cracked and it was unsafe to use any longer. They looked up the price of a new tire but the price was steep since I had my low-profile tires on for the summer. I remembered that I had some snow tires back at home as another option but had no way to drive there now to retrieve them. Steve, the owner of the shop quickly offered that he could drive me to my house to pick them up and bring them back to the shop so they could change them (they were quite fast!). I was very impressed! Both Steve and Gerry the technician who worked on my car were very pleasant, reasonable and easy to talk to. I really appreciated their help today! Ive been going to Westside for years and theyve kept my aging Corolla running well at almost 400k kilometers. I first went there to get a second quote on a very expensive job recommended by the dealership. But Westside told me that what I actually needed was a fraction of the cost. Rather than badmouthing the dealership, they said it was an easy mistake to make. They know what theyre doing and are reasonable. Highly recommended. Great group of people that work here. Shop rates are responsible, and they got me in right away as I needed my vehicle for the next day. I feel like they didnt try and rip me off or add in a bunch of needed to be done work while my truck was there. They fixed the problem and have not had any issues. Honest good service. Reasonably priced. Got the job done quickly. Not much more to ask for in a mechanic! Got my A/C inspected then recharged along with two tires plugged. Was done within 2 hours. Fantastic! Great price, friendly staff and done quickly!! Will use again if my cars ever need repairs!